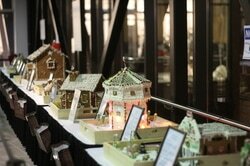 B.Gingerbread Homes - B.Gallant Homes Ltd.
Over 2000 people visited B. Gingerbread Homes this holiday season, an event that combined holiday giving, fun family time and local businesses. B. Gingerbread Homes involved a gingerbread house building competition between business teams, a colouring contest, and hands-on gingerbread house building and decorating for families at the Vancouver Island Conference Center. In total,we had 11 gingerbread houses on display, 225 gingerbread houses built (provided by Port Place Thrifty Foods), 300 gingerbread cookies decorated, and 26 businesses involved! Together, we raised over $2200 for the Nanaimo Salvation Army’s housing programs. The competition was intense! Of the 11 gingerbread houses, 3 entries took home all 6 of the awards. Array Web and Creative, who built a “sweet” rendition of the Bastion, took home the People’s Choice Award, Best Builder Award and Holiday Spirit Award presented by the Vancouver Island Real Estate Board. Riverside Painting, with their “Chateau BonBon” won the Most Shocking Award presented by Osprey Electric. Lastly, Derek Gillette Real Estate won The Suit-est Award presented by The Ensuite and also the Best Use of Materials Award presented by K2 Stone with a chocolate covered miniature of The Ridge housing development in Glen Oaks. All proceeds of B. Gingerbread Homes are going to the Salvation Army’s local shelter programs. Some of these programs include The Cold Weather Shelters program, and their many housing support programs. ​hope to have more gingerbread houses in the competition.